Notwithstanding the political hype, the public perception and recent polls I found it imperative to do some independent research so I could draw my own conclusion; and the reality is as an island, we can lose big, or we can win big, the choice is ours. I had the pleasure of speaking with world renowned sailor, keynote speaker, author, and global investor Neal Petersen whilst he was on island. He loves Bermuda and has been coming here for twenty years; Neal is black and grew up in South Africa under apartheid, so appreciates the mental toughness of Bermudians and the way we keep things working. He and I sat and talked on his yacht for hours. Among the topics that arose was the Americas Cup. I listened attentively as this great seaman delved into his experiences and let me dip into his knowledge of sailing and sailors. Like I said, Neal loves Bermuda but he was a bit glum about some of his experiences. The story was shared to me about how Neal and a few friends went to a coffee shop where they refused to put the coffee in a different cup as asked by the customer, and were treated with less than friendly customer service. Things such as this that seem so small are things that turn off those that visit our island home. Our greatest asset as an island is our people, our service, and our friendly spirit. If the America’s Cup is to be a success we all must play a part in ensuring that we treat each other, and our visitors with the Bermudian hospitality that our visitors have come to know, love and expect. If we do that, these sailors, these wealthy sailors, will be the backbone of a new generation of tourists who grow a relationship with Bermuda and come back year after year. After all, Bermuda will host one of the huge experiences of their lives – talk about home court advantage! Currently, Bermuda does not have the marine infrastructure to accommodate tall ships, and the yachts the America’s Cup will attract. When Neal and I were talking we noticed a tall ship that was docked along a wall in St. Georges’ Harbor. Realistically, if two other ships of that size wanted to berth they couldn’t, simply because the current setup doesn’t allow for it. In preparation for the America’s Cup loads of infrastructure will be built. The good news is that after the America’s Cup, that infrastructure will still be there and Bermuda can easily be the best and most attractive option for tall ships and passing vessels to berth, and to spend time and dollars. I was extremely pleased to hear that Bermuda will be entering a team into the Red Bull Youth America’s Cup. I think this is an enormous opportunity for all young people and I encourage all young people who are interested to take part in the trials on August 8th this year. I was especially pleased to hear about the America’s Cup initiative that saw several key players teaming up in the marine industry to launch a Community Sailing Project. Alongside that, I would advise government to negotiate with the America’s Cup to implement this in all public schools. Think about it – our young people could learn from the world’s best sailors while increasing the popularity of sailing amongst young Bermudians ahead of the America’s Cup. These men and women who are coming from all over the world to participate in the America’s Cup have a wealth of knowledge about the sport and I surely they can be persuaded to see the value of sharing some of that knowledge with our young people. And that’s before we talk about Bermuda’s pilots and pirates, the Bermuda sloop and all the history of Bermudians being great sailors. 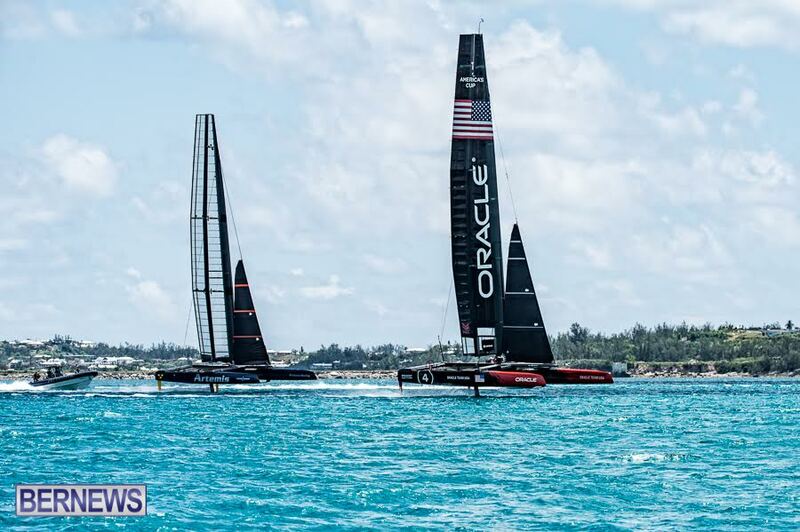 How Will The America’s Cup Benefit Me? Will the average Bermudian like you and I directly benefit from the America’s Cup or are the benefits restricted to a certain class of people, businesses’ or organizations? For sure, the benefits are there and equally for sure, I expect they will go first and foremost to whoever makes the effort to harvest them and last and least to those who ignore the opportunity. I think government should set up an online register of all potential America’s Cup contracts over $5,000 it is awarding, along with details of how and when to bid. Then anyone can compete and all see the value of focusing on this. In fairness, I think there should also be an online report afterwards of where the contracts went so that fairness can be both served and be seen to be served in the eye of the people. 14 Jul: Column: 5 Amendments, Municipal Obsession? 08 Jul: Column: Do Carnivals Have A Place In Bermuda? Opinion columns reflect the views of the writer, and not those of Bernews Ltd. To submit an Opinion Column/Letter to the Editor, please email info@bernews.com. Bernews welcomes submissions, and while there are no length restrictions, all columns must be signed by the writer’s real name. Nice column Eron, nice to see politics left out on this one, and doing your own research.. We need this event to be successful for “all” Bermuda! The Brilliance of Eron. Great article and I must say I continue to enjoy all of your writings. Keep it up Eron. Good looking out Mr. Hill..I agree with Neal, That the service from locals and foreigners is atrocious. People can be so personal without knowing really who they are dealing with, and the occasion to be too familiar because of color needs to be addressed, Bermudians need to treat each other with courtesy and professionalism, regardless of origin or colour.. It is very disheartening to want to support Bermuda as a Bermudian and to be met with a “familiar” attitude of” oh its just you bermudian!” and a frown,.. also the foreigners don’t seem to see us or give us the politeness…. Professionalism is the ability to separate personal views and give services that are being paid for.. I would suggest that the Bermuda Tourism authority spend money on customer care services instead of getting promotions. Doesn’t seem like the industry is ready if they are not prepared to smile and give good service.I have recently been on the receiving end of this service within hotel and resturants, Managers please address this subject of professsionalism with frontline workers ..
unfortunately, you can teach a person to do a job but you can’t teach them to smile. many an employer would take a smiler over a person with the credentials but has the miserable attitude. Actually, the BTA introduced the National Service Standard Programme to the industry back in January and it has the industry’s full support. To-date, more than 40 businesses have had over 400 of their employees take part – all are now proud Certified Tourism Ambassadors (CTA)! This includes restaurants, retailers, guest accommodations, ferry workers, and more. The program is administered by the Bermuda Hospitality Institute and is expected to grow to more than 1000 CTA’s by next summer. If you want more information, contact BHI 295-5049. Well written, Eron. The online contracts idea is a good one. Hopefully it gets implemented. Had to drag race into it didn’t he. Oh well nice to see that because a sailor who happens to be black supports the AC that makes for a whole new veiwpoint from Eron. Maybe he can drag his PLP colleagues along with him into supporting it rather than trying to trip up progress wherever possible. He couldn’t avoid dragging race into it, how many black people World Wide are directly involved in Americas Cup. It’s two wealthy guys racing for bragging rights and whoever can afford it, build one and join in . Not like you’ve ever done it. Nope. Never. Despite your ignorance, you don’t need to be wealthy to be into sailing. Its a great spectator sport. If you could stop moaning about race for a moment you might enjoy it. Frankly Triangle black sailors are few and far between so a successful role model like this lovely sounding guy is relevant. Like Eron I believe that there are millions of ways that Bermudians can employ enterprising ideas to exploit the good fortune of hosting the AC. Those that miss out will be those that just let it pass them by. A sailing outreach program in the schools already exists – its called WaterWise, http://www.bermudasail.bm/index.php/programmes/48-waterwise. It is being augmented by the America’s Cup Endeavour outreach program which from the sounds of it should help expose more young people on the Island to the great sport of sailing. Now we just to make sure that these programs survive long after the America’s Cup has left our shores! BEDC and Chamber of Commerce are assisting the ACBDA with bidding to ensure fairness. The ACEA and the various teams are spending their own money so unfortunately it is unrealistic that they will share their vendor contracts as it would put them at a competitive advantage (for the teams at least). The 2/3 poll was completed prior to the BTA and BEDC business opportunity information sessions, although the results were released after. I am sure that the perception numbers would have shifted after the opportunities were explained and laid out. To be fair, he is only referring to government contracts. This says it all. “If the America’s Cup is to be a success we all must play a part in ensuring that we treat each other, and our visitors with the Bermudian hospitality that our visitors have come to know, love and expect. First this Government needs to give its PEOPLE Bermudian Hospitality, then in return we will give. Life is a two way street Jack. It actually would be understandable if someone for the first time read this post from you and thought, maybe you just woke up stupid today??? But to those of us that actually read your nonsense everyday, we know you woke up stupid the first time you woke up in your life??? I will join the pro chorus, nice article and very on point. Great relief to see an opinion column that is just that. we need more opinion columns like this imo. We are lucky in that the spend/investment and revenue capture are all the same Government. In SF the city put up the funds, but the tax revenues were spread between the City, County, State and Federal Governments making it very hard to make a return. Well, we’re at $77 million so far. The erroneous reference to an existing spend rate of $77m is lie repeated often by PLP talking heads and their MPs who either believe everything they’ve been spoon fed by the party, or worse know the difference and choose to ignore the truth in favour of perpetuating the PLP’s campaign of disinformation in the hope of destabilizing Bermuda for their own selfish gains. Either way it’s anti-Bermudian, self serving and a betrayal of the public’s expectation for honest brokers. No we’re not. Another PLP myth. Is not a main driver of Bermuda obtaining the America’s cup to promote Bermuda offshore and to stimulate the local economy? If we end up showing a loss of $11.5 million with a resulting $364 million in economic impact, I’d called that a win. San Francisco got a suicide net for the Golden Gate Bridge out of the deal . What safety net will Bermuda get from the event ? Hopefully tax revenues to avoid the debt suicide pact the PLP signed us up for. Very well-written piece! Notice how few of the bloggers paid attention to your suggestion that the Government produce a list of all vendors who won contracts for more than $5000. The real economic impact of the AC for Black Bermudians should go beyond entertainment and service jobs. After all, we are in 2015. Glad you mentioned that DREB!!! Can you list for all of us the contracts YOU handed out ( over $4 million ) during your reign of terror??? Hopefully you notice I was being generous and only asked for those over $4 million??? I think your blind followers will be shocked if you answer honestly and tell them how many ( freinds ) you yourself handed them too??? After all this is 2015, so you should have no problem answering this should you???? The contracts are really no business at all of the general public. They are private agreements between private partys. Even less relevent is the race of who got what contract. These are business agreements made with people who can provide the service. The colour of anyones skin is not a factor. The only thing that has any colour is the money paid into Bermuda. It is the much needed USD & it is green. That’s pretty rich coming from you. You’re not an average Bermudian Eron….you’ve got a silver spoon in ya mouth too bra lmfao! !